Ever wondered where to buy stencils for furniture and walls? Yes, your local craft stores have stencils, but they’re unlikely to be the cool, trendy stencils that you see paraded all over Pinterest. 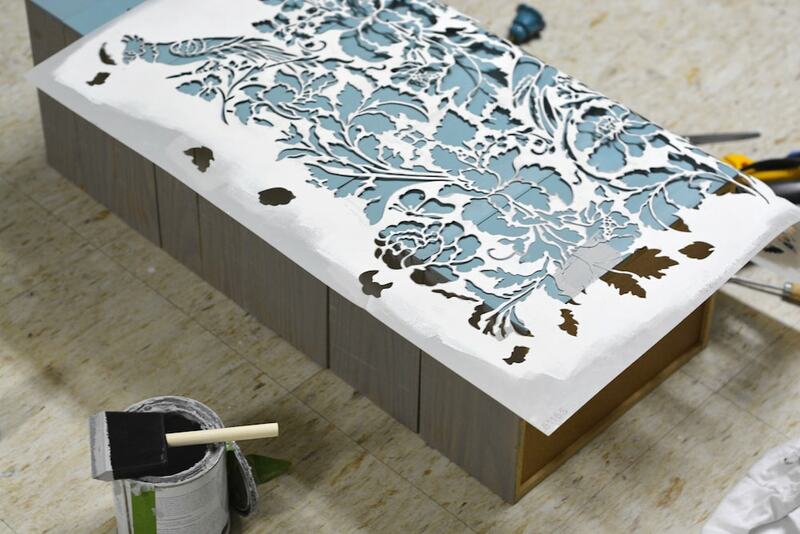 You can take the most boring piece of furniture and add a coat of paint and stencils and–BOOM!–suddenly it has an amazing “WOW” factor it didn’t have with just a coat of paint. 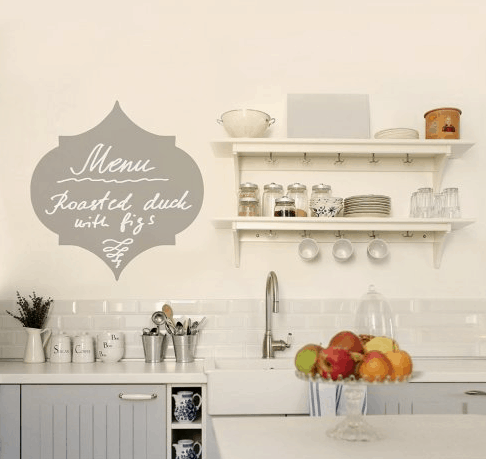 That’s what I have used stencils in many of my DIY projects because it adds a bit of flair without needing to buy many more tools or materials–only buying stencils. And I tend to use the same stencils over and over, so they’re cost effective when you look at how many projects on which you can reuse them! But the question is, where to buy stencils for furniture and walls? For those quality and trendy stencils, you’ve got to go online. And in this post, I’m going to share with you my top favorite places to buy stencils, along with info on how I sometimes like to make my own stencils. This post contains affiliate links, which means if you buy something from them, I earn a small commission from the companies, but it doesn’t cost you anything. And I only recommend things I really do love. Thanks for your support of this free and valuable blog! CLICK HERE TO PIN AND SAVE THIS POST. Here are the places that I’ve found have really great places for buying stencils. The very first stencil for furniture that I owned was from an online stencil shop called Royal Design Studio, one of the largest online retails for furniture and wall stencils. It was a gorgeous Floral Damask stencil that was so pretty on everything from table tops, outdoor tables, and on wooden notebooks that I had hand-crafted. I even had laid this gorgeous stencil over drawers stacked together to create a cohesive stenciled set of drawers in a jewelry box. When you own quality stencils like from Royal Design Studio, you can reuse them over and over again! Here are links to where to buy stencils for furniture and walls, which happen to be some of my favorite stencils! 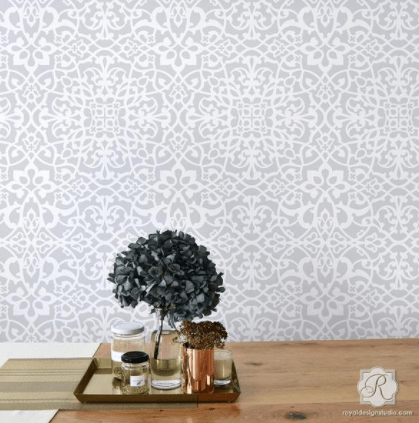 Floral Damask Wall Stencil – This pretty floral damask stencil has been used on at least 5 different projects in my house! You will absolutely love it! 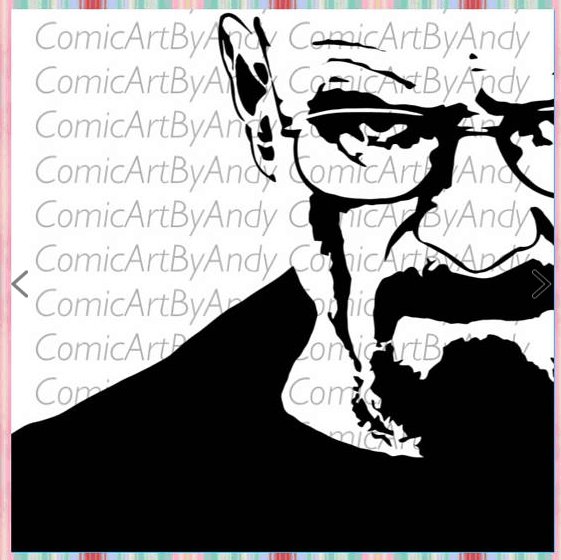 (This is the stencil that I used above). 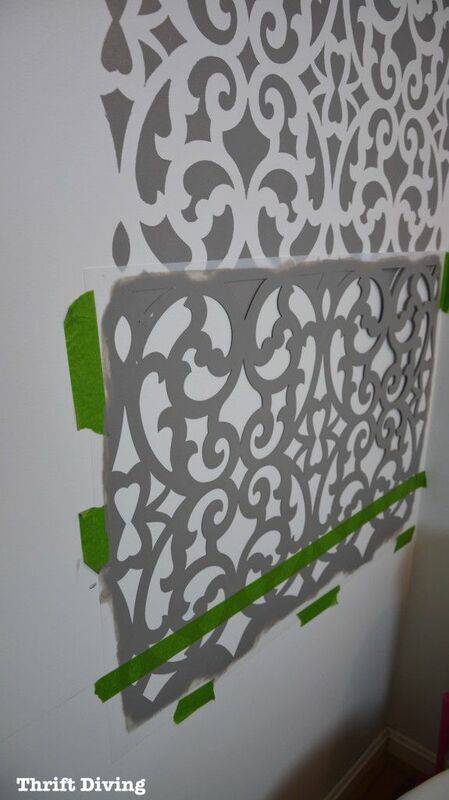 Mansion House Grille Trellis Wall Stencil – I used this stencil for my half-bath makeover (seen below) and it turned out very well! I’ll admit that it was hard stenciling around such tight corners in a small bathroom, but I stuck with it and loved how it turned out! You can even watch the full video tutorial here. Stitched Arrow Craft Stencil – This stencil is perfect for a teen’s bedroom, pillows, and accents around the home, such as dresser drawers. 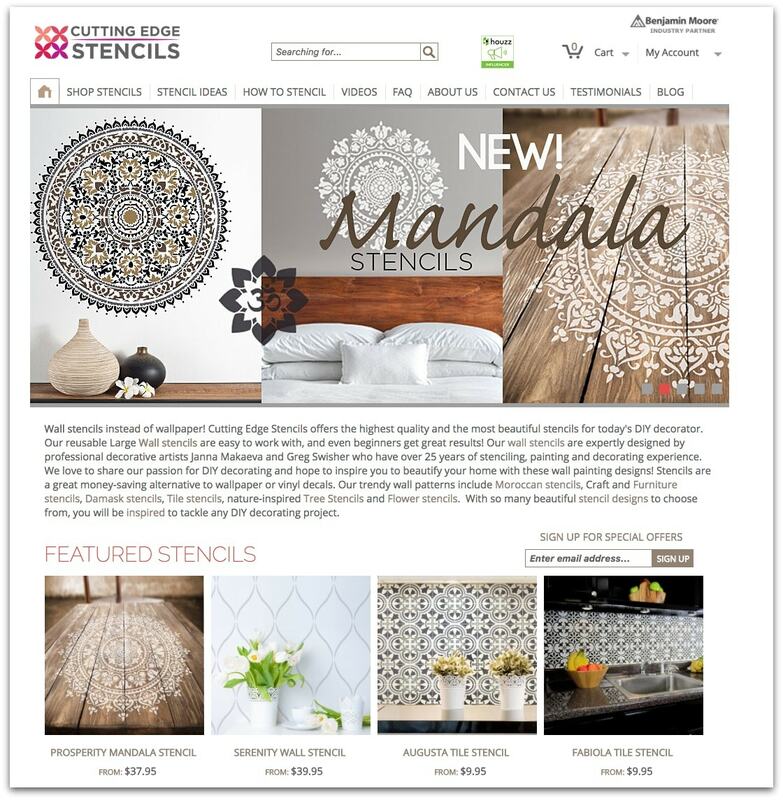 Palace Trellis Moroccan Wall Stencil – This stencil looks great as a wall accent, on ceilings and walls with molding to accent its artistic beauty, and “busy” enough that little imperfections in your wall or stenciling technique wouldn’t be noticed. Love this one! 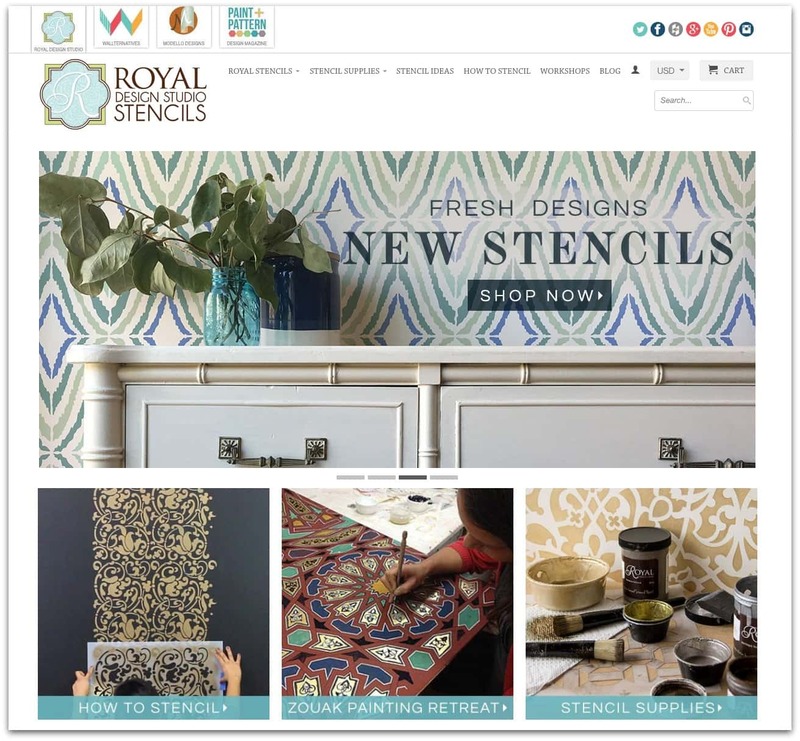 Royal Design Studio actually sells Annie Sloan Chalk Paint on its website, too. I’m not sure when this awesome change happened, but I think they’re headed in the right direction! It seems like a one-stop shop for all your stenciling needs, which makes getting all the products you need for stenciling jobs pretty easy. READ: What’s the Best Paint For Furniture? I’ve never used Cutting Edge Stencils but they’re right on par with Royal Design Studio stencils. 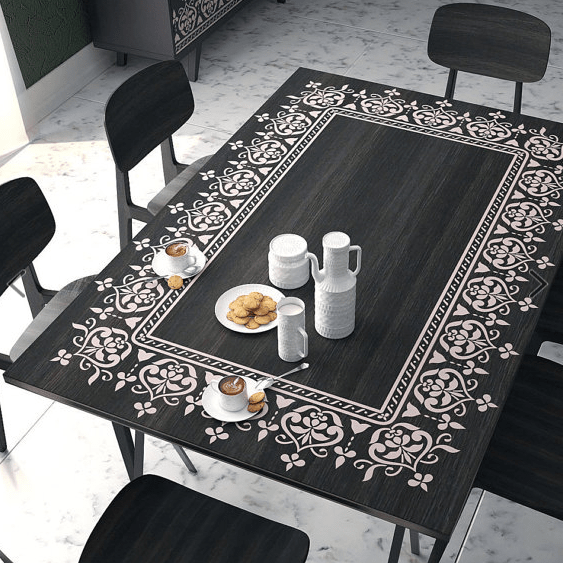 If you’ve been confused about where to buy stencils for furniture and walls, Cutting Edge Stencils is one of the few big-name sites that offer really attractive, on-trend stencils. Below are a few of my favorite Cutting Edge Stencils! Chalkboard stencils – Love that they offer big designs where you can actually write inside of them, like the Chiara Chalkboard Stencil above! How cute! 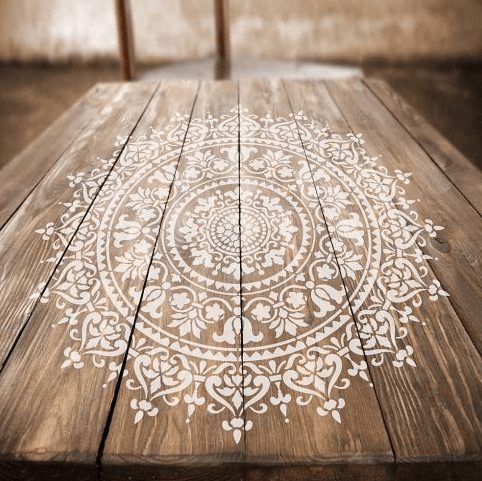 Mandala stencils – These stencils remind me of beautiful, symmetric henna tattoos for your walls and furniture. Love them! Cutting Edge Stencils goes above and beyond on their website to offer free PDF Printable Instructions on how to stencil, which is a great option so you can print them out and have them handle while working on your projects! They also have a bunch of tutorial videos, and while most of them seem a bit old and outdated, the information is still very relevant and helpful. You also received a free “surprise” stencil (worth $4.95) with each order. Love that they do that! We all know and love Etsy, right? It’s the best place online to support your favorite artisans, including people that can make awesome stencils. Don’t forget to check Etsy for buying stencils because there are a bunch of creative people that deserve a chance. Here are a few of my favorite stencils for furniture and walls on Etsy. The thing is that if you’re looking to buy large stencils for walls, which are typically larger, many of these craft and home improvement stores aren’t going to offer those. You’re likely to be limited in the size of the stencil you can find there. Use large stencils for walls, and stick with Royal Design Studio and Cutting Edge Stencils for those larger wall stencils. For smaller craft projects like pillows, small wooden boxes, etc., you can definitely find cute stencils from these craft and home improvement stores. Just be sure to check the size of the stencil before buying, especially if you’re buying stencils online. 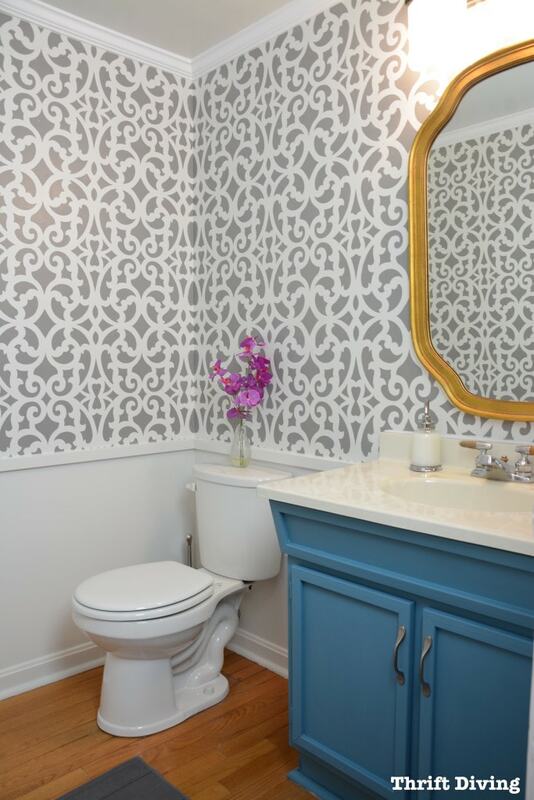 A larger stencil such as this one that I used for my half bathroom makeover allowed me to get the stenciling done quickly since I could cover more area. (P.S. 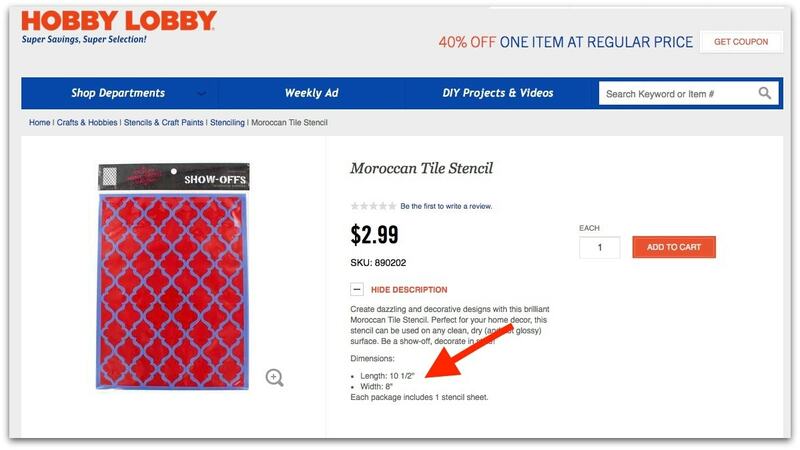 Notice that this Moroccan tile stencil from Hobby Lobby is pretty small and would work well for pillows, dresser drawers, table tops, etc.). When it comes to making your own stencils, you’ve got a couple of choices. First, you can go the cheap route and get some stenciling sheets from Amazon, with a stencil cutting knife, and design your own stencils. Or you can go the expensive route and buy yourself a DIY cutting machine. 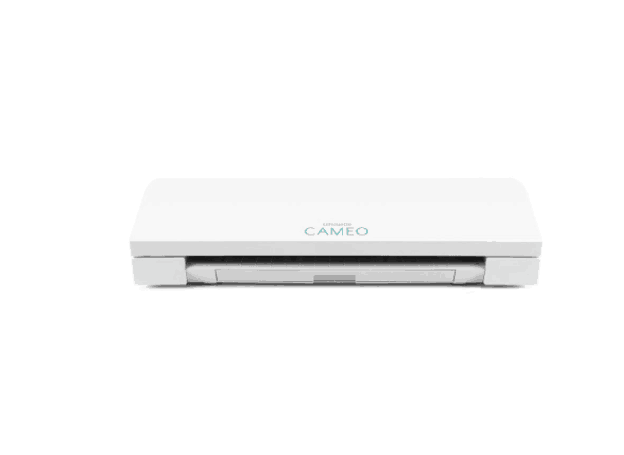 Several years ago I bought a Silhouette Cameo which can cut stencils and vinyl (among other things like paper, cardstock, and fabric up to 12 inches wide). I haven’t nearly used my Cameo for everything it can do! I have only used my Cameo for cutting vinyl. I used my Silhouette Cameo to cut out the stencils for these cute DIY hanging fence garden planters that I made. I tend to use vinyl to make my stencils because they give such a crisp edge. There’s very little bleeding underneath of the stencil as long as you don’t overload the paint or stencil brush. 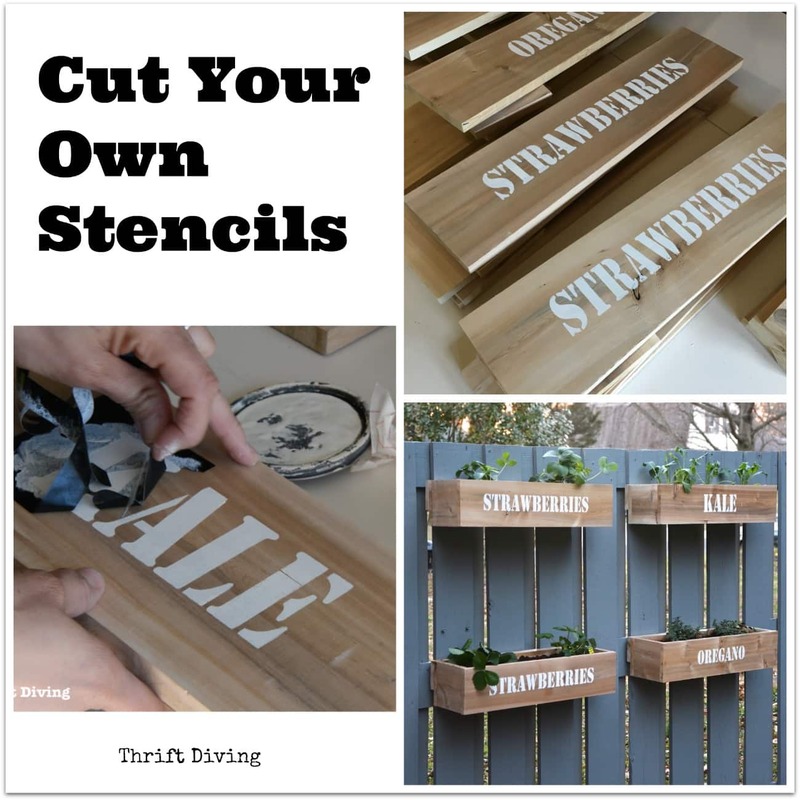 For awesome instructions on how to make your own stencils, check out this awesome tutorial from Denise at Salvaged Inspirations. What Paint Should You Use For Stenciling? 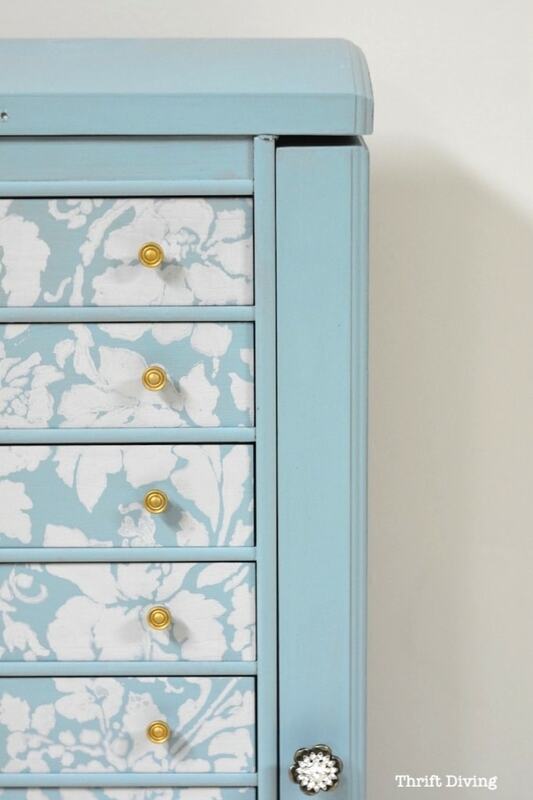 People always ask me “what paint should I use when stenciling furniture?” and I always have to lead them back to my in-depth post called What’s the Best Paint For Furniture? There’s not one best paint. They all work pretty well on furniture with little to no sanding or priming. So don’t get caught up on which paint to use (but check out the post to read the PROs and CONs of the 10 most popular brands of furniture paint). One option to consider, though, is FolkArt Chalk paint. It’s relatively inexpensive and I tend to use this paint for stenciling onto wooden signs. It’s only about $5.50 so it’s perfect in small amounts for not a lot of money and comes in 42 colors. 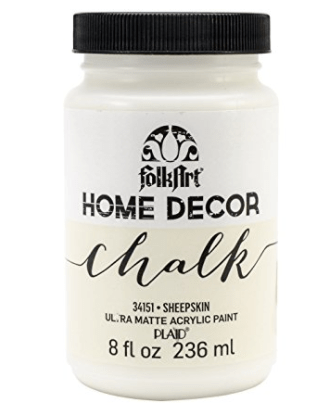 You can buy FolkArt Home Decor Chalk here on Amazon. The paint you use on your walls should be different than the paint you’d use on furniture. Wall paint doesn’t stick quite as well as paint designed for furniture unless you sand and prime. Furniture paints are “hearty” and will stick to nearly anything–wood, plastic, glass, metal–you name it, generally without sanding or priming first (yes, even shiny furniture). 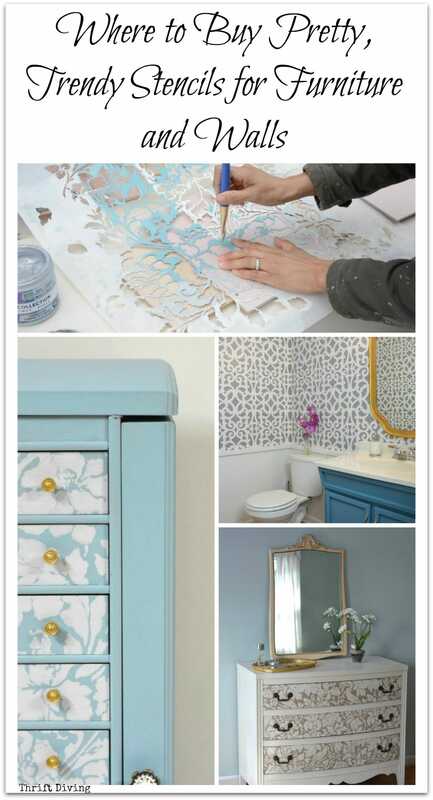 Now that you know where to buy stencils for furniture and walls, get inspired with some of these stenciling projects. Be sure to check out my post How to Use Stencils: A Complete Guide for info on how to use stencils, especially if you’re a newbie to stenciling! So now you know where to buy stencils for furniture and walls! And don’t forget that you can stencil fabric, glass, plastic, and a bunch of other things, too! From where do you like to buy your stencils? Share your secrets below and let’s chat about stencils! « 10 Clever Questions to Repurpose ANYTHING (Even If You’re Not Creative)! And thanks again for another great tip. I’ll be doing several projects this fall I hadn’t thought much to stencil. In the meantime I plan to catch up with more of your youtube vedios this weekend. It will be my version of Netflex binging! After seeing what you did with that metal cabinet. I’m eager to rework an up right file cabinet that was offered to me. Maybe I will stencil it later this fall. Until then; I thank you for being a bright place of hope until I complete my current move. To give a new look new concepts and ideas are always around us what we all to do is to analyze then find them and apply them to make something beautiful. it is possible because nothing is impossible in this world. Lovely concept and lovely work, enjoy the reading and the concept. I recently bought a Cricut but I have not made a stencil yet. I will have to give it a try. Love your work with stencils. When I was younger and lived in a mobile home, I had a small hearts/dutch flower stencil and everything in my house had the design on it. Every cabinet door, lampshade, pillow, etc. Take my advice and don’t do your stencil that way! We sold the place, but I don’t think my stencils helped! Thanks for all these stenciling tips. I have been thinking about purchasing a cameo, so i was very interested in your comments about it. And you just nail that 10 miler! You’d love the Cameo, Missy! But be sure to check out the Cricut, too. I have friends that say they prefer the Cricut over the Cameo. Not sure how they compare price-wise, though. And yes, the 10-miler! I worked my way up to 7 miles earlier this week! WOO HOO! 10 miles here I come! Rock that 10-miler and all the training leading you there. Thank you for writing this post and sharing with the world. I was recently bitten by the “stencil bug” and am literally stenciling everything in sight. Very addicting. Like you said…stencils add a wow factor! And since I binge-watched the Royal Stencil YouTube channel…I will definitely follow your links to buy my next stencil from them and show my love for your awesome blog. Thank You Serena ~ Goodnight! Awww…Shirlene, you are awesome! Thank you for the support! LOL about you stenciling everything. One of the other comments here mentioned about stenciling EVERYTHING in her mobile home years ago–like EVERYTHING! All with the same stencil. Too funny! I do hope you’re changing up your stencils and not turning into a “One Stencil Wonder” like me and that other reader. HA! Yeah, I love Royal Design Studio stencils! 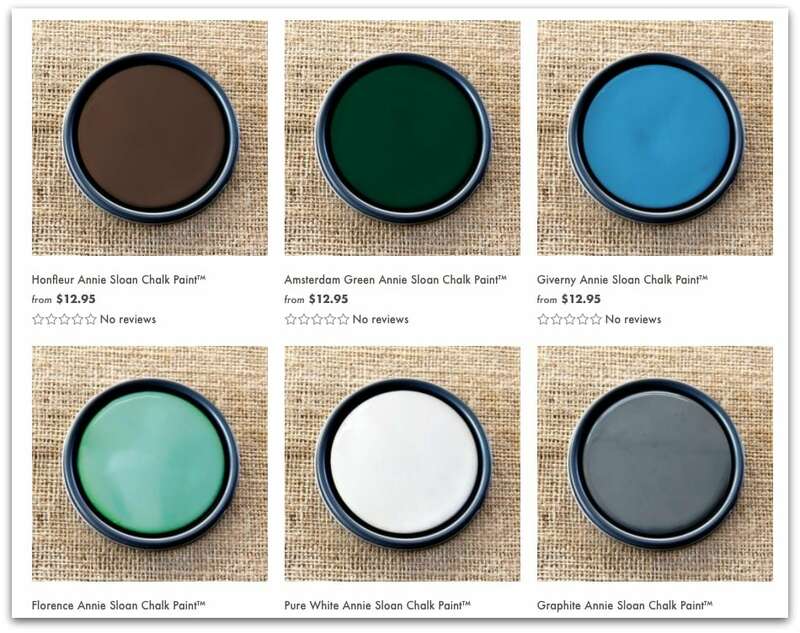 And I love that they are selling Annie Sloan chalk paint there, too, so that you can order everything together. Very smart move on their part, for sure!